As any alchemist worth his salts will confirm, the magic of a compound depends on the quality of the individual ingredients in the recipe. If the ear of a bat is stipulated, there’s little point in including the eye of a toad; if the tongue of a vole is specified, there’s little point in dropping in the rear leg of a sand lizard. Quality ingredients are essential if the tonic is to work its wonders. It is much the same in a Royal Arch chapter. The quality of the individual companions will determine the combined success of a ceremony. Where quality is in abundance, a successful installation ceremony will ensue. Pictured from left to right, are: John Chapman, Barry Jameson, Tony Rigby and Joe Codling. Blackpool Chapter of Integrity No 5864, if the above is an accurate analysis, would promise to produce an entertaining and magical installation ceremony. 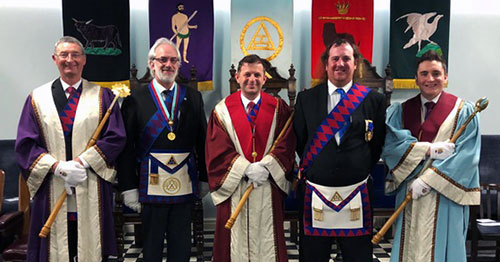 With a plethora of first class Masons in its midst, success was inevitable when Anthony Rigby, more familiarly known as Tony in Masonic circles, was installed as first principal of the chapter and Joe Codling was placed in the third principal’s chair. Unfortunately, due to unforeseen circumstances, Nick Cutting was unable to be present to claim his rightful place in the second principal’s chair. Nevertheless, the ceremony was a perfect mixture of excellent ritual and cheery celebration. Principal guest on the evening was Second Provincial Grand Principal Barry Jameson, extremely well supported by fellow grand officers; Assistant to the Provincial Grand Principals David Randerson, Stuart Thornber and David Harrison and acting Provincial grand officers; Dave Barr, David Thomas, Philip Bolton and Juan Topping. Also in attendance were the Chairman of Blackpool Group John Turpin and Trevor Drabble and Jack Monks (both of whom are Past Provincial Grand Scribe Ezra’s), along with Jonathan Selcoe who is to be promoted to the same high rank in October 2018. Adding further lustre to the list of dignitaries were Blackpool Group Vice Chairman David Cook, group secretary Steve Jelly and group charity steward Ian Stirling who is director of ceremonies in the chapter. Providing an ideal start to the proceedings, first principal Alan Barnes conducted the general business of the chapter with alacrity and dignity in readiness for the entrance of Barry Jameson and his entourage of notables. Having settled into their respective seats, the dignitaries were treated to a magical and entertaining ceremony. Individual performances were exemplary and the collective programme was a masterpiece. The general business having been dispensed with, Alan invited Bob Bennett to act as the installing Scribe Nehemiah and Philip Alderson to occupy the third principal’s chair, while John Chapman acted as second principal. Carrying on as he had started, Alan installed Tony Rigby as first principal in fine style and it set the scene for continued excellence. Tony is a highly respected young Mason who literally brings a special chemistry to the chapter, having a degree in applied chemistry from Manchester Metropolitan University and being a member of the Royal Society of Chemistry, gaining Chartered Chemist and Chartered Scientist statuses with the Science Council. But Tony is no science nerd. His hobbies are diverse and far-removed from academia; including falconry, shooting, fishing and motorcycling – not exactly what one might immediately associate with an analytical services manager. Pictured from left to right, are: John Chapman, Gordon Ivett, Tony Rigby, Kevin Croft and Joe Codling. Perhaps it is Tony’s rare qualities that make him such an ideal first principal of the chapter. Combine Tony’s abilities with those of second principal Nick Cutting and third principal Joe Codling and one has a perfect line-up to govern Blackpool Chapter of Integrity. Throughout the ceremony the standard of ritual was of the highest order. Acting second principal John Chapman has gained an enviable reputation for excellence and third principal Joe Codling has repeatedly proved himself in both Craft and Royal Arch. Add to these the names of the companions who delivered the robe addresses and one can appreciate why the ceremony was so good. Group historian Gordon Ivett is meticulous in everything he puts his mind to and that grit and determination came to the forefront in his presentation of the scarlet robe and Kevin Croft ensured excellence in his presentation of the blue robe to his great friend Joe Codling. Both were exactly what the doctor would have ordered. As Nick Cutting was unable to take the second principal’s chair, there was no need for a purple robe address but perhaps the chapter will include it in the next convocation’s agenda. One can only hope so. Scheduled to perform it at the installation was Alan Whitehouse. Alan is a superb ritualist, putting plenty of zip and spice into his theatrical deliveries. Hopefully, the companions will have an opportunity to wallow in Alan’s delivery at their next convocation. 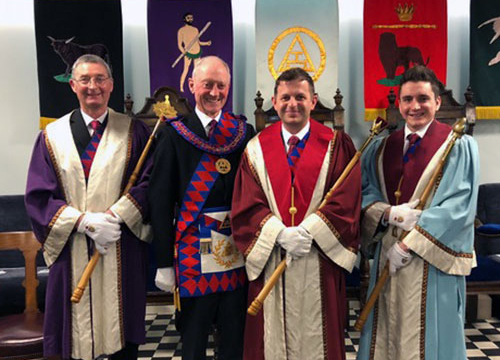 Twice past first principal of the chapter Philip Alderson (2003 and 2005) is another steady, reliable companion who insists on perfection – and that is exactly what he dished up in his address to the three principals. Jonathan Selcoe is legendary as a ritualist and fully demonstrated that his reputation is well earned. Whatever piece he is asked to recite, he does so with panache and power. Jonathan, along with the delightful Trevor Drabble, bring vast experience to the chapter and act as perfect catalysts in bringing out the best in their fellow companions. As if inspired by what went before, Barry Jameson pulled out all the stops and delivered a peach of an address to the companions of the chapter. It was a fitting conclusion to a magnificent installation ceremony. They left the chapter room with manifest gladness to continue the celebrations at the festive banquet and having slipped a hearty fare into their abysses, it was time for the proletariat to settle down for the customary toasts and speeches. These too continued in the same vein as the excellence set during the installation. There was a strong spirit of family togetherness, that same spirit that had inspired them throughout the entire formal element of the evening; that same spirit that motivated them to join in with the song to the three principals that David Harrison punched out with passion and sincerity, accompanied by John Wall at the piano. The chemistry in the Blackpool Chapter of Integrity was strong and inspirational and was heartily soaked up and appreciated by all present. Let the magic continue! Pictured from left to right, are: Jonathan Selcoe, Dave Barr, Gordon Ivett, Stuart Thornber, Barry Jameson, John Chapman, David Cook, Tony Rigby, Juan Topping, Joe Codling, Philip Bolton, Alan Barnes, David Harrison, John Turpin, David Thomas and Ian Stirling. Photographs courtesy of John Turpin.